In a talk entitled “The Role of the Media: Singapore’s Perspective” delivered at Columbia University on 4 Nov 2010, Home Affairs Minister K Shanmugam perpetuated the same well-rehearsed myths that justify the PAP’s ironclad grip on the mainstream media in Singapore. The Minister was spot-on about one thing though – the arguments he raised were a function of PAP paranoia. The Singapore media scene is dominated by two government-linked publishers, Singapore Press Holdings and Mediacorp. In the years after independence in 1965, Singapore hosted a vibrant media scene comprising various English and vernacular presses that ran a wide range of views on issues of national interest. Shanmugam argued that today’s PAP was not going to be an irresponsible government and gamble with the lives of Singaporeans by hosting a free media. Going by Shanmugam’s argument, was the PAP of the late 1960s and early 1970s “gambling with the lives” of Singaporeans in allowing numerous independent and privately controlled newspapers to operate? Was it an irresponsible government? Surely not. With men like Goh Keng Swee, Hon Sui Sen and S. Rajaratnam helming the fort, such a suggestion is ludicrous. Until the Newspapers and Printing Presses Act 1974, the first-generation PAP leaders not only survived and lifted an entire generation of Singaporeans out of poverty, they also set the foundations for extraordinary growth in the face of a flourishing media environment immediately after independence. The logic follows that the current crop of PAP leaders, unlike their predecessors, are incapable of handling the real-world realities of the competitive media environment. This is in spite of the million-dollar annual salaries that Goh Keng Swee would have been loathe to pay today’s PAP ministers. The history of mankind has shown that race and religion can be exploited for political purposes – in fact, Singapore’s experience with the 1964 riots makes this point out. Never mind for a moment that the predominant catalyst of those riots resided in the political tension between the PAP and UMNO, and not with the media. What Shanmugam conveniently left out is the positive role the media can play, and has played, in bridging and bringing differences between different racial communities together. Sometime in 1992, in an extremely sad episode in modern India’s recent history, a country that gained independence slightly more than 15 years before Singapore, Hindu zealots destroyed the Babri mosque in the town of Ayodhya in Uttar Pradesh. The rabid act of Hindu religious violence was rooted in contested claims to the land on which the mosque was built. In late September 2010, the High Court of Uttar Pradesh delivered its judgment with an order to divide the disputed land three ways. The role of the media in the run-up to the judgment was noteworthy. In response to the government’s request to the hyper-competitive Indian media to exercise restraint in reporting the Ayodhya verdict, the country’s media responded by coalescing opinion from faith, business, industry and political leaders, amongst others, restating India’s commitment to secularism, diversity, tolerance and respect for religious minorities. Even though India hosts a very significant minority of 150 million Muslims, the verdict was dissected and argued over vigorously. Yet, no violence ensued and the media’s positive influence had equally positive knock-on effects on Indian society and economy. In his tiresome justification on the dangers of racial and religious strife, Shanmugam seems to have conveniently ignored the giant strides made by Singaporeans in building a multiracial society. National Service for one, has been an incredible adhesive. While one can portend the possible existence of a radical and lunatic fringe that is racially chauvinistic – there simply isn’t a multiracial utopia anywhere in the world. Yet, larger and far more complex multiracial polities in the developed and developing world have accommodated a free media in the name of an informed citizenry. In fact, in appealing to paranoia as the foundation of the PAP’s media policy, Shanmugam effectively put the brakes on the organic development of a tolerant Singaporean society. Shanmugam’s points about Singapore’s population size, physical size and short common history were curious defences that were left intellectually unsubstantiated. What the new Minister of Home Affairs must acknowledge is that size is paradoxically one of Singapore’s greatest strengths in dealing with racial and religious disharmony. Possible racial tension is nipped in the bud and the support of grassroots leaders can be quickly canvassed to return a potentially fractious situation to a state of normalcy. In fact, when the tudung issue of 2003 blew up, causing some consternation within some elements in the Malay community, the government was quickly able to bring Malay leaders to dialogue and diffuse the situation. It appears that as far as Singapore’s short common history is concerned, this was yet another red herring that Shanmugam is quickly earning a reputation for invoking. If true, it must mean that other multiracial countries that secured independence in the two decades after World War 2 – not very much older than Singapore – would equally have too short a common history to accommodate a free media. The absurdity of this argument speaks for itself. In keeping the media under the purview of the government so as to determine the boundaries of any public discourse in the media, the PAP has shrewdly ensured that Singaporeans end up looking to the government for answers to even the most fundamental aspects of their existence. This is the same PAP government that ironically insists Singaporeans cannot expect the PAP to have all the answers to public grievances! As for Singapore’s small population, this writer certainly does not hope the Minister was alluding to the cerebral incapacity of Singaporeans to decide on what type of Singapore Singaporeans want for themselves and their children. Although given the elitist and eugenically inspired mindset of not a small number of PAP leaders, it would be surprising if the Minister was indeed of the opinion that only the elite in Singapore can deal with a free media. If true however, the arrogance and conceit of this position is very much in line with the PAP’s elitist belief system. In casting doubts about the professional integrity of journalists, Shanmugam seemed to be suffering from an irrational fear of the media. But his fears were misplaced and unreasonable. He ought to know better that rotten apples are found in any profession, not just journalism. Only two years ago, the fat cats in a number of Wall Street banks proved equally, if not more susceptible, to vice, greed and ethical compromise as compared to journalists. As a reputable lawyer himself, the Minister must be acutely aware of the not insignificant number of Singaporean lawyers running away with clients’ monies over the last decade. In fact, in 2005 a lawyer and member of his own party and MP for Hong Kah, one Ahmad Khalis Abdul Ghani, was found guilty of “grossly improper” unprofessional conduct. In singling out journalists while overlooking their vitally important mission of educating the mass public of the ongoings in society, Shanmugam gratuitously cast journalism in bad light. This unusual fear of journalism is perhaps a classic symptom of a paranoia complex. This is why mature and rational politicians in many developed countries speak of codes of conduct for the media, in addition to the prospect of legal penalties in cases of egregious violations. Even light regulation for any profession can go a long way to reduce the temptation of unethical conduct. Shanmugam shrewdly predicated his defence of the PAP’s media policy by claiming Singapore did not want to mirror the US media. When Singaporeans cajole the government for greater press freedoms, no one is specifically identifying one media model for the country to follow. 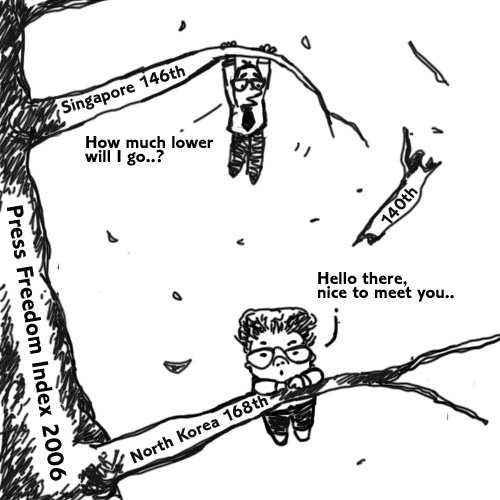 Most Singaporeans would be rather proud if Singapore Press Holdings could report and detail issues of national interest with the same vigour and relative objectivity as the British Broadcasting Corporation (BBC) or even Malaysiakini, an online Malaysian news publisher that has even been complimented by Minister Mentor Lee Kuan Yew, no less. In fact, Singapore is in a great position to select best practices from media the world over and adapt a system that works best for Singapore’s needs. The current editor of the Straits Times, Han Fook Kwang, was once quoted as saying, “We’re aware people say we’re a government mouthpiece or that we are biased.” It is publicly known that the SPH’s group president from 1995-2002 was a former director of the Internal Security Department under the auspices of the Ministry of Home Affairs. The current political editor of The Straits Times is a former Internal Security Department officer. Rather than claim that Singaporeans reject a US-style media scene (yet another red herring reeled in to obfuscate the substantive issue), Shanmugam should focus on removing the wanton perception in Singapore of a mainstream media that is manipulated behind the scenes by the PAP. Whichever way any Singaporean looks at things, a government-managed media scene will only provide one shade of the truth for its people. Alternate sources of news and information that are factually unimpeachable and evince a very high quality of journalism play an incredibly important educative role in any society. There is no reason to posit that Singapore society will descend into chaos should Singapore choose to amend the Newspapers and Printing Presses Act and open up its media scene to private publishers that are subject to the rule of law. In concluding his speech to his American audience, Shanmugam compared Singapore with US cities like San Francisco where the incumbent political party has remained in power for a long time. Even though his speech was about the media, Shanmugam seemed to conveniently forget that San Francisco hosts a free media where the political opposition is not politically hamstrung by obstacles put in place by the incumbents. More pertinently, in San Francisco, politicians do not live in glass houses but can cope with and shake off personal attacks with comprehensive political proposals, and critically, without resort to defamation suits. In the final analysis, Shanmugam’s ill-advised remarks – like the attempts of many politicians throughout history to justify press-control and manipulation in favour of the incumbent leadership, authoritarian regimes and to minify alternative views – confirmed an unhealthy PAP paranoia that is effectively retarding the evolution of a tolerant and socially attuned Singapore society. Taken to its logical end, this paranoia and irrational fear of the media can cloud good judgment and may end up irreversibly inhibiting the intellectual development of the very society the PAP claims to protect. Pritam Singh is the founder of OpinionAsia (www.opinionasia.com). He is currently a Juris Doctor candidate at the Singapore Management University and a member of the Workers’ Party (http://wp.sg). The views expressed here are his own. Pritam also blogs at singapore2025.wordpress.com.